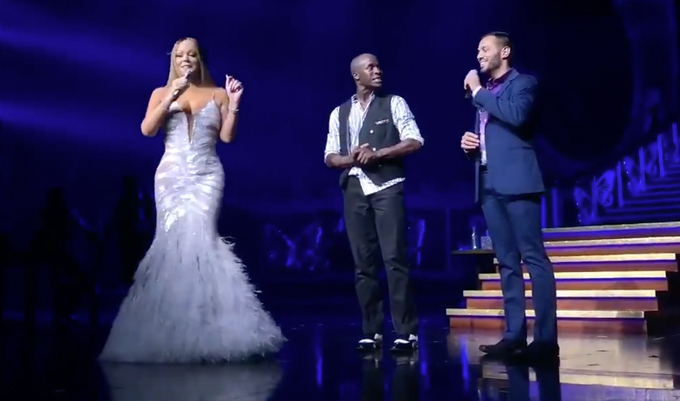 MariahCarey > News > Mariah turns over concert stage for surprise marriage proposal! Mariah Carey proved once again why she is the queen of love. On Saturday, the twice married Carey halted her Las Vegas show, "The Butterfly Returns," to invite one of her male backup dancers onstage with her at the Caesars Palace Colosseum. They were then joined by the dancer's boyfriend, who had been backstage watching the performance. "We’ve been planning this for a long time, and you didn’t know about this, so hopefully you’re going to be surprised in a very good way," Carey said before leaving the stage to the couple for their special moment. The audience went wild as the dancer's beau dropped to his knees, held out a ring and said, "Would you do me the honor?" Carey later posted video of the proposal, along with the caption, "He said yes!!!"